Author(s): Max Conway, University of Cambridge Computer Laboratory. Claudio Angione, Pietro Liò. Frameworks for metabolic engineering have been successfully applied in combination with pre- and post-processing algorithms on genome-wide metabolic models. However, genetic engineering methods with a particular focus on understanding results from multiple perspectives and combining automated and human design are still lacking. To this end, we adopt a multi-objective genetic design technique to find the optimal gene expression levels in genome-scale metabolic reconstructions. 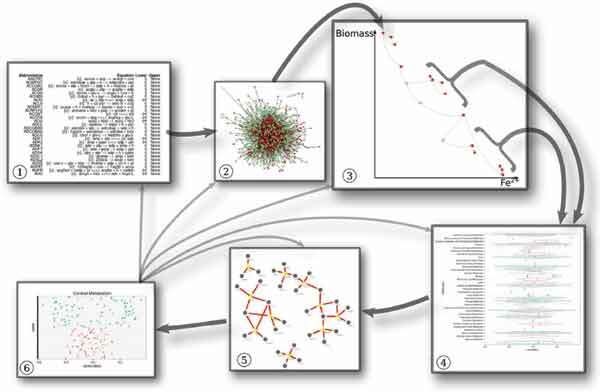 Then, we analyse the optimized network by introducing a new multi-omic, multi-level post-processing and visualization procedure, Metabex, which uses Cytoscape for network visualization. These two components are connected together to form a feedback loop that establishes a continual process of machine optimization and human analysis and guidance. To benchmark our framework, we optimize two species of Geobacter for electricity production and biomass synthesis; we achieve increases in electricity production for only a slight decrease in biomass. Many regulatory strategies contributed to this value, locally and globally. For instance, a direct, local strategy was a down-regulation of Cytochrome C Oxidase, while there was simultaneously a global reduction in cofactor and prosthetic group biosynthesis. Finally, we discuss multiple applications of our tool, including model exploration, model engineering, comparative modelling, meta-analysis and model refinement. Keywords: Meta-analysis, gene expression engineering, multi-scale model, metabolic network exploration. Affiliation:University of Cambridge Computer Laboratory. Keywords:Meta-analysis, gene expression engineering, multi-scale model, metabolic network exploration. Abstract:Frameworks for metabolic engineering have been successfully applied in combination with pre- and post-processing algorithms on genome-wide metabolic models. However, genetic engineering methods with a particular focus on understanding results from multiple perspectives and combining automated and human design are still lacking. To this end, we adopt a multi-objective genetic design technique to find the optimal gene expression levels in genome-scale metabolic reconstructions. Then, we analyse the optimized network by introducing a new multi-omic, multi-level post-processing and visualization procedure, Metabex, which uses Cytoscape for network visualization. These two components are connected together to form a feedback loop that establishes a continual process of machine optimization and human analysis and guidance. To benchmark our framework, we optimize two species of Geobacter for electricity production and biomass synthesis; we achieve increases in electricity production for only a slight decrease in biomass. Many regulatory strategies contributed to this value, locally and globally. For instance, a direct, local strategy was a down-regulation of Cytochrome C Oxidase, while there was simultaneously a global reduction in cofactor and prosthetic group biosynthesis. Finally, we discuss multiple applications of our tool, including model exploration, model engineering, comparative modelling, meta-analysis and model refinement.